April 18, 2005 marks the 10th anniversary of The Michigan Economic Growth Authority, a program established by Michigan government with the mission of spurring in-state job creation and business investment. The authority is the state of Michigan’s agent for selecting firms to receive Single Business Tax credits in return for creating new facilities and jobs in Michigan. These MEGA agreements also result in local incentives for the recipient firms, and often in other state incentives, as well. MEGA was originally limited to providing packages only to firms that created new jobs at single sites in such industries as manufacturing, office operations, or research and development. Five substantive amendments to the program since 1995 have allowed MEGA to offer packages in return for smaller job and investment totals, for the retention of existing jobs, and for jobs in additional industries. Through 2004, more than $1.8 billion in Single Business Tax relief has been offered to more than 200 firms in 230 MEGA agreements over as much as 20 years. The value of these MEGA agreements rises to more than $3 billion with the inclusion of other state and local incentives, such as property tax abatements, job training subsidies and infrastructure improvements. Nearly one-third of this total — $987 million — has been provided by local units of government or by local economic development agencies. Scholarly estimates suggest that nationwide, the targeted incentives distributed by state and local governments exceed $50 billion annually. 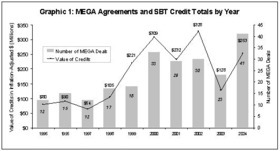 The number of MEGA packages and the total size of the SBT credits offered each year has generally been rising, despite dips in 1997, 2001 and 2003. In 1996, MEGA’s first full year, MEGA offered just 15 deals, totaling $89.9 million in SBT credits. In 2004, however, MEGA produced 41 packages valued at $253.3 million (for up to 20 years) in SBT relief alone. MEGA agreements are expected to create two types of jobs — "direct" and "indirect." "Direct" jobs are new jobs at the specific firm sites that are the subject of the MEGA package. "Indirect jobs" are new jobs created outside these specific firm sites in response to MEGA-related investment and direct employment. State documents indicate that approximately 127 of MEGA’s agreements should have produced fully employed facilities through 2004 — i.e., sites hosting all of their projected direct jobs. Of these 127, about 56, or 44 percent, have claimed credits under the MEGA program. A company can claim these tax credits, however, without meeting the initial total direct job projections. In fact, only about 10 of these 56 cases can be shown to have created the number of direct jobs originally projected within the expected time frame. MEGA originally projected that these 127 MEGA deals would generate 35,821 direct jobs by 2005. MEGA figures obtained in December 2004 shows that these deals have actually generated about 13,541 direct jobs — roughly 38 percent of original expectations. MEGA’s direct job total through late last year thus represents about 0.3 percent of Michigan’s 2004 workforce. Between 1996 and 2004, MEGA originally estimated that more than $220 million in SBT credits would be redeemed as a result of MEGA agreements. Lagging direct job creation, however, meant that companies claimed just $75 million in credits, or about 34 percent of original expectations. In two commentaries published in newspapers in November 2004, state officials claimed that the MEGA program had produced 28,812 total jobs. This figure is higher than 13,541 because it includes indirect jobs purportedly created by the program. It fails to fully correct assumptions made in earlier years that have since proved too optimistic, with the likely result of overstating the numbers. 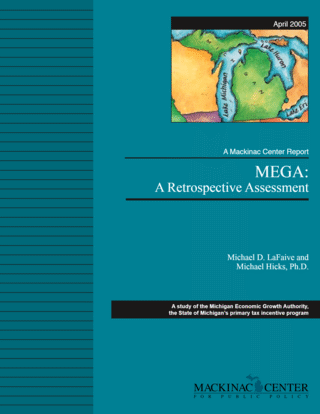 MEGA did not improve Michigan’s per-capita personal income, employment or unemployment rate. MEGA apparently caused a temporary shift to higher construction employment without increasing overall employment. One temporary construction job was created for every $123,000 in MEGA credits awarded; 75 percent of these jobs disappeared after one year, and the remaining 25 percent fell away after two. There was a concurrent, statistically significant decline in construction wages as a result of MEGA credits, but it was too small to be economically meaningful. Academic economic literature increasingly recognizes a "political economy" in public policy whereby political incentives to gain public approval for a program and its supporters can interfere with effective policy decisions. In economic development programs, this dynamic can favor projects with a higher public profile, such as those that benefit well-known or exciting new businesses or industries, even if these efforts are not necessarily the wisest use of resources. State officials’ promotion of MEGA and other state economic development programs has in the past suggested political incentives may be playing a role in officials’ support for these policies. Legislative support for the Jobs I and Jobs II packages in 2003 appear to be instances of this. Concern over potential political appeal may also be evident in several apparent overestimates of job impact by state officials in MEGA and related state programs. In one specific MEGA agreement, a company official detailed his disagreement with MEGA’s projections of job creation at his firm. Michigan’s auditor general has also twice criticized (non-MEGA) Michigan development agencies for the overstated job creation numbers the agencies had reported on audited programs. Such overestimates of economic impact are not particular to Michigan. A Toledo, Ohio-area economic development agency recently reduced its own job creation claims substantially following the departure of an agency executive. Media scrutiny played a role in this reduction, but it came several years after the fact, and after the responsible official had departed — a delay in accountability that is unsurprising given the long-term nature of economic development programs. The presence of targeted economic development programs can generate counterproductive business incentives, as well. A recent study of the state of Ohio’s economic development incentives between 1993 and 1995 found that while the incentives had no positive economic impact, the businesses that received incentives were more likely to overestimate employment forecasts than businesses that had not. Similarly, at least one major consulting firm has recently counseled businesses on how to position themselves aggressively to receive state economic development grants. Such tactics can lead government officials to favor less productive deals over better ones. The MEGA program could begin to serve specific, short-term political and corporate interests, rather than the long-term goals that inspired the program. Not only might this combination of interests lead to a misallocation of state development monies toward less effective projects; it might also lead to lower economic growth, according to a 1999 study of state economic statistics in the continental United States. MEGA officials are faced with the task of picking companies that can create and sustain jobs in the Michigan marketplace. But the marketplace decisions that lead to new employment and new business investment in Michigan are made by millions of individuals with their own subjective preferences and individual understanding of local market conditions. The economic literature increasingly recognizes that the inherently dispersed nature of their knowledge and preferences makes predictions about which companies can successfully create and maintain new jobs exceedingly difficult for any observer or organization to determine. One recent analysis shows that that between 1995 and 2000, only one of the 45 largest stock funds outperformed the Standard and Poor’s 500 index, and it did so only by a small margin. MEGA engages economists at the University of Michigan to aid MEGA’s future employment projections through the use of a respected computer-based economic model known as REMI, short for Regional Economic Modeling Inc. The REMI modelers at the university appear to use the model skillfully and responsibly. Nevertheless, several aspects of the model and the assumptions used with it may be leading to optimistic estimates. These issues involve the treatment of the direct cost of state tax relief, the cost of local incentives in MEGA packages, the differences between high- and low-unemployment areas, the failed employment and wage assumptions apparent in past simulations, and the potentially increased cost of new state and local government services following new business investment and employment. State law specifically requires MEGA to determine that "the expansion or location of the eligible business will not occur in this state without the tax credits offered under this act." If there is an error in determining this — i.e., if a firm would have located in Michigan without the credit — the cost of the credit to the state and its economy rises. In practice, making such a determination will be difficult, both for MEGA officials and for the firms concerned. Several case studies indicate how business calculations can change, so that an unattractive location may become attractive on further review, despite the absence of a tax credit. The potential for a revision of opinion can be particularly high if a firm already had strong reasons to locate in a particular location. One way to determine the rate at which businesses might not ultimately need a credit that initially appears essential would be to study the subsequent actions of businesses that sought MEGA credits but were denied them. Gathering a comprehensive list of such firms has proved difficult, however. Given the underperformance of MEGA projects, the program’s manifest lack of economic impact in its first seven years, and the inherent difficulties in making such a program work, it would probably be best to cancel the MEGA program. The state has alternative ways to improve its business climate that are more likely to be effective. Concerns about MEGA are only amplified by questions about the program’s fairness to firms that do not receive tax credits. These concerns are further underscored by a recent federal court case that suggests MEGA may be unconstitutional. Audit MEGA. The state could consider asking the Office of the State Auditor General to conduct regular, expanded audits of MEGA’s direct job counts. Such oversight could help improve the authority’s accounting procedures. The auditor general’s office could also be encouraged specifically to review applications by MEGA candidates that were rejected. The results of such a review could help clarify the extent to which the MEGA credits have truly been necessary. Count Direct Jobs Only. It would probably facilitate public review and understanding of the MEGA program if indirect job benefits were no longer reported and cited by MEGA officials. "Spin-off" considerations could still be part of the evaluation process for a particular project, but MEGA would no longer make a formal or informal practice of tallying the indirect jobs its past and future projects could claim. Removing MEGA officials’ focus on indirect job counts might free the authority to more carefully document its direct job creation. Develop a Transparent Framework for Tracking Success and Failure. The status of each MEGA project could be posted and updated live on the Web each month to show such basic items as the following: the state and local incentives offered in each MEGA package; the state and local incentives claimed in each MEGA package; the cost of these incentives so far and in the current year; the current direct job figures; what the direct job figures were originally projected to be at present; and so on. Such reporting would facilitate effective public oversight of the program’s effectiveness. Commission an Independent Econometric Review. An independent researcher could be engaged to maintain a peer-reviewed and publicly transparent econometric model that annually reassessed MEGA’s impact. The model employed in this study was crafted to detect past impact, rather than predict future performance. Regular updates of the findings would therefore be appropriate if the MEGA program continues.